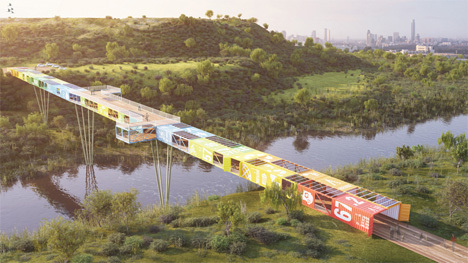 In keeping with the ecological theme of the new Ariel Sharon park, the bridge – designed by Yoav Messer Architects – is composed of recycled waste. These shipping containers were among the 800,000 or so discarded every year. 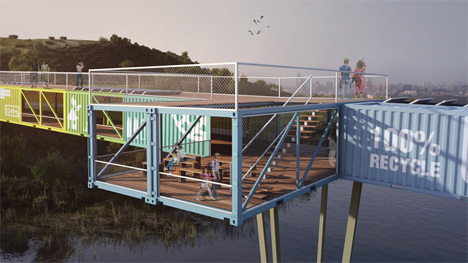 The architects turned these wasted cargo containers into a beautiful and functional space. Far from being simply a conveyance over a body of water, the ECOntainer Bridge is an attraction unto itself. It features numerous observation points and exhibition spaces, making it into a fascinating space rather than just a way to get from one side of the park to the other. Available only to pedestrians and light vehicles, the bridge will be a tranquil structure free of cars. 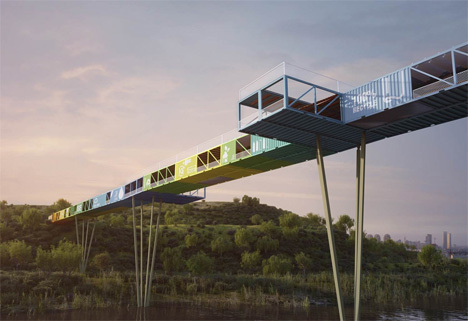 Thanks to the modular nature of the cargo container bridge, most of the construction can be done off-site. The containers also lend themselves well to quick and easy repairs and upgrades. When work must be done on one part of the bridge, removing and swapping out parts is much quicker and simpler than it would be with a conventional structure.